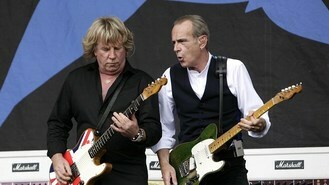 Francis Rossi and Rick Parfitt have been filming scenes in Fiji for the picture, due to be released next year. Other stars involved in the film are Jon Lovitz and Laura Aikman and the project has the strapline: "It started with guitars ... and ended with guns." Rossi said: "A month in the sun was great but the film world is tough. Lots of late nights, early starts and plenty of standing around. Much like rock n roll really. "We can't wait to see the results and find out if we really can hang up the guitars and change careers." Status Quo's manager, Simon Porter, also crushed speculation the band's original line-up would be heading back to the recording studio to make a new album followed by some live dates. "Since the four former band-mates got together to record interviews for the forthcoming documentary on the band there has been a lot of comment about future activity. "I can place on record the fact that there are absolutely no plans to record a new album and that no live dates have been confirmed."